Here at Visionary Computer, we pride ourselves on really going the extra mile for our customers. Recently we had a case where we had to go even further. One of our customers had suffered a building fire. Thankfully no one was hurt but their computers were all completely destroyed. One computer in particular was business critical. It was an ancient circa 1999 G3 Blue and White and, as you may be able to see from the photos, it was melted closed and severely burned. The customer brought it to us without much hope for the data. Thankfully we have been servicing Macs since way before the G3 so we knew how to crack open the melted plastic without introducing additional damage to the critical hard drive. Once inside, we were able to extract the drive from the scorched carcass. The drive itself would spin but it would not mount, we knew it was time to leverage our partnership with the world leader in data recovery, DriveSavers. The drive was shipped out overnight to DriveSavers recovery lab in California. Within a few days they called with the mostly good news. They had data but because of the age and file type of the files, they could not determine if the data was good or bad. They could see some other random standard files the customer had and they were in tact which made us hopeful the critical files would also be functional. 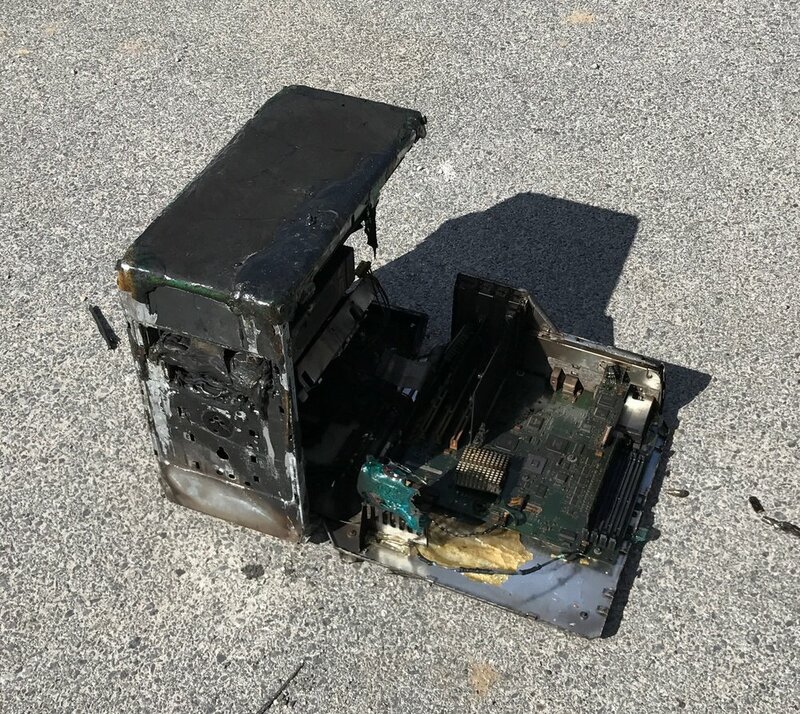 The recovered data was overnighted to Visionary and we attempted to load the data on an old Mac the customer had in an off-site storage facility. The old Mac was also a G3, this time a Beige G3. This G3 was so old and unused that it was literally caked with dust (see photos) so when we tried to load the data from CD it wouldn’t work. Luckily we had an old Mac in the shop which was old enough to talk to the G3’s hard drive but new enough to load the media on which we had the recovered data. We fed the data into the G3’s hard drive then reassembled the G3. With fingers crossed we pressed the power button and…it worked! All the customer’s critical data was up and running! Looking at the condition of the G3 B&W when it arrived at our shop, I honestly did not think recovery would be possible but with the help of some key partners like DriveSavers and relying on some of our ancient computer knowledge we were able to bring a smile to one customer’s face. We at Visionary Computer are ready for our next challenge, how can we help you?